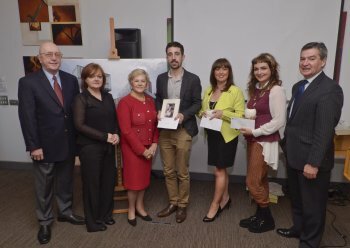 Ceramic artists Christopher Banks and Kerrie Hanna along with Celtic Studies student PÃ³ilÃ­n UÃ­ GhallachÃ³ir are the 2013 winners of the Richard K Degenhardt Belleek Collectors’ Scholarships. The international scholarships are awarded annually in memory of the late Richard Kennedy Degenhardt who was instrumental in establishing the Belleek Collectors’ International Society. They are funded through the generosity of many individuals and groups, including Belleek collectors world-wide, international Belleek Chapters, special friends and family of Richard K Degenhardt, the Belleek Pottery and the Belleek Collectors’ International Society. The awards have been given out annually since 2001 to undergraduate or graduate University of Ulster students who have excelled in the fields of Ceramics or Celtic Studies. Since its inception, the Scholarships have provided 30 outstanding students with the opportunity to expand their knowledge and undertake research which they would not otherwise have been able to carry out. The 2013 awards of £650 each were presented to the successful students at the University of Ulster’s Belfast campus by Dr Linda Beard, Chair of the Degenhardt Scholarship. Dr Beard dedicated the ceremony and this year’s awards to the late Professor Bob Welch, a Research Professor of English and former Dean of the Faculty of Arts at the University of Ulster, who died earlier this year and was instrumental in setting up the Scholarships with Linda Beard. “Bob Welch always represented what was the very best about the University of Ulster. He never said no and he always listened,” she said. University of Ulster Vice Chancellor Professor Richard Barnett said: “Through the enthusiastic work of Dr Linda Beard, the Richard K Degenhardt Belleek Collectors’ Scholarships continue to go from strength to strength. PÃ³ilÃ­n UÃ­ GhallachÃ³ir from Letterkenny, Co Donegal, graduated from the University Of Ulster in 2012 with a first class BA Hons in Irish Language and Literature. She is presently studying a Master’s of Research at Ulster and intends to commence a PhD entitled ‘The Irish of An Tearmann, Co Donegal’ in September 2013. For her PhD thesis she proposes to carry out a comprehensive linguistic analysis of the Irish dialect of An Tearmann in its terminal phase. This dialect has not been previously linguistically investigated and because there are a very small number of native speakers remaining in the parish she feels it is important this dialect is recorded and archived for the future. PÃ³ilÃ­n also wants to enhance her knowledge of phonetics for her research and will use her award to attend the specialist training course ‘Phonetic Theory and Field Phonetics’ at the Leiden University Summer School in the Netherlands during July. Kerrie Hanna, from Holywood, Co Down is currently a second year student in Fine and Applied Art. She will use her award to attend two ceramics festivals, the International Ceramics Festival, Aberyswyth, Wales and Clay in Art Festival, Hatfield, England. She will attend workshops in building techniques and firing processes, view demonstrations by important figurative artists who practise her specialism (psychology in gesture and expression), hear talks by artists functioning commercially in the business sector and find out about residencies available globally for ceramicists. The award will also assist with covering her expenses at ‘The Public’, a community creative art space in Birmingham where she will volunteer and explore the art scene. Christopher Banks from Dundonald is a second year student on the BA (Hons) Contemporary Applied Art course. His award will fund activities to advance his critical and technical knowledge in the making of ceramic and glass objects, by attending the Northlands Creative Glass conference in Lybster, Scotland. The conference, entitled ‘The Real Thing: Beyond Stereotyping’, brings together artists who are experts in their fields and curators and writers who will lecture on the theme of cultural identities. Christopher’s award will also finance a one-on-one teaching session at Warm Glass studios in Bristol, which focuses on casting and mould making. He will have the undivided attention of a skilled teacher for a day’s tutoring in an area that is a fundamental component to his practice.